"Is it time yet?" said the Cub. "Nearly so," said Mother softly. World Read Aloud Day 2012. World Read Aloud Day is one week away! To help get you ready, here are your Top 7 Actions for an incredible WRAD! 1. Host a Book Swap Bash with your friends and bring short pieces to read that make people laugh. 2. Gather a group of children, donate some books and stay awhile to read them together. 3. Change your social media avatars to the WRAD Badge to rally your friends and colleagues! 4. Spread the word: Write about WRAD on your Facebook, Twitter, or Blog. 5. Head to our Activity Page where you can download our flyers, worksheets, recommendations, certificates, and more to fill your World Read Aloud Day with action, excitement and learning! 6. Make sure on this day that you read to your own family or loved ones or find a new friend to read to! 7. 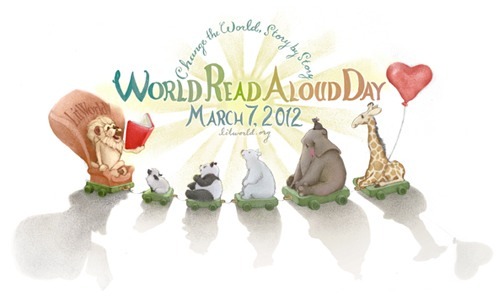 Upload your photographs & videos from your World Read Aloud Day celebration on our WRAD Upload Page. Check out this video of Jerusalem preparing for World Read Aloud Day by reading Shel Silverstein's "Colors!" Newer PostMarch 7th: Pam Holds A Live Facebook Chat from the Scholastic Store in Manhattan! Older PostThe Countdown Begins! It's Time to Get Ready for World Read Aloud Day!